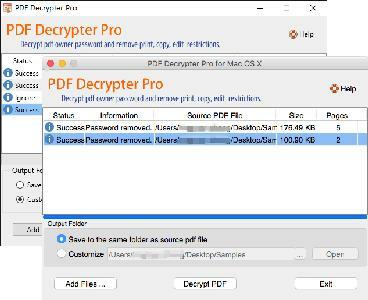 PDF Decrypter Pro can be used to decrypt protected PDF files, which have "owner" password set, preventing the file from editing (changing), printing, selecting text and graphics (and copying them into the Clipboard), or adding/changing annotations and form fields. PDF decrypt is being done instantly. Decrypted file can be opened in any PDF viewer (e.g. Adobe Acrobat Reader) without any restrictions –- with print / copy / edit functions enabled. All versions of Adobe Acrobat are supported. PDF Decrypter Pro does not rely on any other third-party software, of course Adobe Acrobat and Reader are NOT required. Do you have such kind of experience that a PDF (Adobe Acrobat) file Can not be printed, copied, or edited? If yes, This is because PDF file has had password security and other restrictions added. 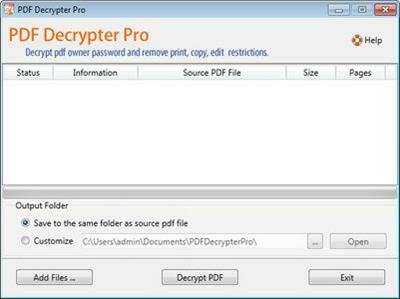 The PDF Decrypter Pro can help you Remove the password and restrictions in a few seconds.